Saturday.....YES!!! Next week I have a 2-day week and then a well-deserved Thanksgiving break....YES!!! The school year is just flying by already! I cannot believe that my blog will soon be celebrating a one-year anniversary!! Can you say, "GIVEAWAY?"!! "I've got a pretty cozy group of followers that I would love to shower with gifts to celebrate my first year as a blogger...stay tuned for that. This week in Room 19 was....CRAYFISH WEEK! As part of our science unit on Structures of Life (A Foss Kit), we learn all about the structures of the crayfish. Of course, we have some live crayfish that spend the entire semester "vacationing" in our classroom....lovely! (We also enjoy a family of Madagascar Hissing Cockroaches.....more lovely!). The highlight of our unit is the much anticipated, Crayfish Project. Students demonstrate their understanding of crayfish structures by making a 3-dimensional model of a crayfish that includes all of the proper structures. They also have to add elements to the crayfish that tell something personal about themselves. For example, if you love soccer you might make a soccer-playing crayfish. The students even give their crayfish names. On Monday, all of our thirdies brought in their crayfish creations and presented them to the class. Here are a few of my favorites (I actually love them ALL). I am so intrigued by all of the Thanksgiving projects that teacher's do with their class. When I taught first grade, I used to have my students make a turkey out of construction paper and then hang them in the hallway and call it "Mrs. Olenczuk's Turkey Farm." I would even add a portrait of myself wearing a farmer's hat. Ahhh...the good ol' days!! Nowadays, as a third grade teacher, I try to find fun ways to get my students writing, especially on special days of the year. 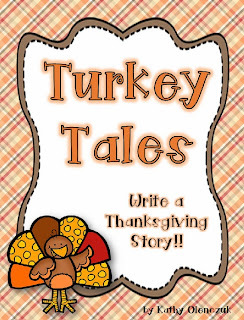 I love the idea of writing a story about how the turkey gets away on Thanksgiving. I have seen this activity done in many different ways by teacher friends over the years, including having students create a "turkey in disguise" where the students make a turkey and then disguise him in silly ways. GOOD, CLEAN FUN!! Here is a fun freebie to get your students writing next week....enjoy! Have a wonderful Thanksgiving weekend! !